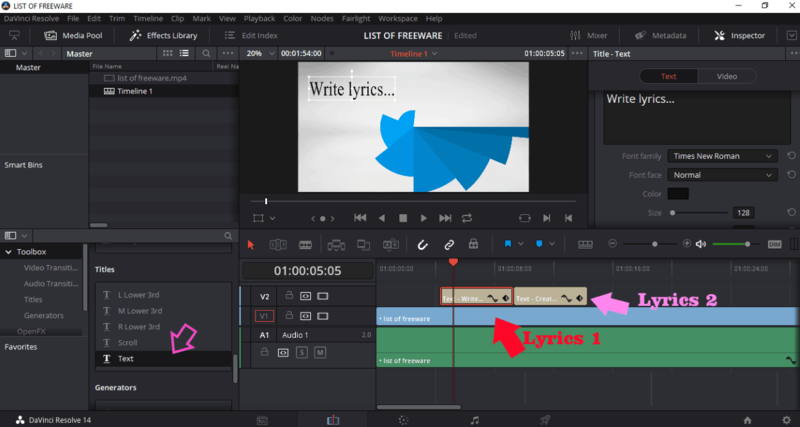 Here is a list of Best Free Lyric Video Maker Software For Windows. Using these freeware, you can create stunning lyrical videos. 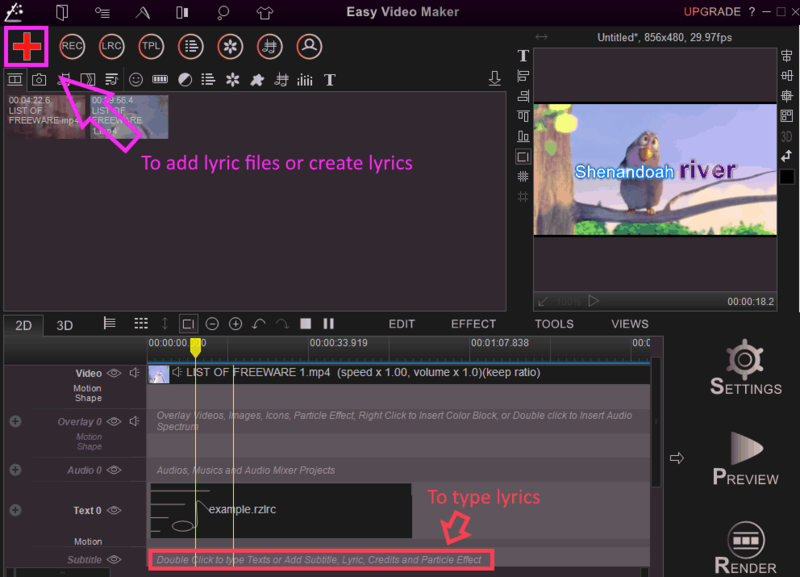 These are basically video editors which let you make lyric video one way or another. These let you import media files (image, video, audio) and then add lyrics to video. You can also edit existing videos and add lyrics to them. All of these basically provide text tools to add lyrics to create a lyrical video. You can add multiple text boxes to the video and then manually sync them with videos. One of these also provides the flexibility to create a lyric file and then add it to the video and make synchronization accordingly. You can even add standard lyric files (lrc) to the video. To sync the lyrics with the audio, you can use timeline. Also, real-time preview of lyrical video is provided in all of these to make accurate lyrics synchronization. You can modify font, color, size, tracking, line spacing, anchor point, rotation angle, drop shadow, stroke, background, etc. In addition, multiple transition effects can also be added to the lyrics. The supported formats in most of these lyric video creator include MP4, AVI, WMV, MOV, MKV, etc. Easy Video Maker is one of my favorite software to make lyric video because it provides direct options to import and sync lyric files with the video. I also like Windows Movie Maker as it was quite easy to create lyric video using it. You may also like to checkout best free Software to Add Lyrics To MP3, Karaoke Software, and Lyrics Downloader Software for Windows. Easy Video Maker is one of the best free lyric video maker software. It lets you create lyric files and then sync them with the videos. Or, you can simply use its timeline to add text and manually sync it with the video. Just add desired video (AVI, MP4, MPEG, WMV, FLV, MKV, etc. ), audio, images, etc. and drag added content to the timeline for editing purpose. Now, as mentioned above, you can add lyrics to video in two ways. Import or create lyric files and sync them with the videos: Click on the plus sign and select Add Lyrics (.lrc) or Lyric Maker option to import or create a lyric file to add to the video. As you do that, a new window will open up where you can import music and text files too to match the lyrics with music. You can add lyrics as new lines with index, start time, and end time. Check this tutorial in case of any difficulty. The lyrics files are created and saved in .rzlrc format. Add lyrics directly to timeline: You can add text directly through timeline using Text layer and match the start and end time accordingly. The real-time video preview is available on the interface itself. Hence, you can make changes precisely. It lets you customize text font, alignment, etc., add motion effect to text, mask effect, transparency, etc. It provides a wide number of font customizations which you can explore. You can view the final preview of the lyrical video using the Preview button. Now to save the video, click Settings button and set the output parameters (video profile, size, frame rate, quality, output format, etc.) and finally hit Render button. Easy Video Maker is one of my favorite lyric video creator and also an overall video editor software. Using it, you can slow down a video, speed up a video, edit MKV videos, resize videos, etc. To create a video project, you can import desired media files which include video (MP4, AVI, MPEG, MOV, M2T, M2TS, MTS, MXF, DV, HDV, WMV, etc. ), audio (WAV, MP3, WMA), and images (JPEG, PNG, GIF, BMP, etc.). Drop the content on the timeline to start editing the video. Select the timeline and click on Make Composite Shot option. The real-time preview of edited video can be seen on the main interface. As highlighted in Red in above snapshot, you can use plus button to add lyrics in multiple lines. You can type lyrics in the added text box and also rotate, scale, and move the text box anywhere in the video. To adjust the lyrics duration, drag, collapse, or move respective text object on the timeline. At the left side, you will see different tabs including Media, Controls, History, Effects, etc. One of these tabs is Text where you can modify lyrics appearance including font, size, color, alignment, character spacing, etc. To add transitions to text, go to Effects tab > Transition and drag any transition to added text object on the timeline. You can add different transition effects to different text objects on the timeline. To export the video, it supports MP4, AVI, and image sequence file format. You can save the lyrical video by going to Export tab > Export Settings. Here, you can specify video width and height, aspect ratio, bitrate, frame rate, profile, etc. It also lets you upload output lyrical videos directly to YouTube. HitFilm Express is a nice and feature-rich lyric video maker. Apart from that, you can also use it to add VFX effects, add video filters, rotate videos, etc. Windows Movie Maker is a pretty easy to use lyric video maker software. Choose where you want to add the text or lyrics, such as at the beginning, at the end, at the selected clip, etc. After doing so, add the lyrics by simply typing or using copy-paste method. You can then add animations to lyrics (fade in, typewriter, flashing, moving titles, and more) and modify lyrics font (color, size, font type, alignment, etc.). After making changes, click “Done, add title to movie” option. The title will be added to the selected position in the video on timeline. Now, to synchronize added lyrics with the audio, drag it to “Title Overlay” section. From here, you can manually adjust lyrics duration. Repeat above steps to add multiple lyrics lines to the video. It provides real-time preview of the lyrical video. Hence, you can make changes precisely. After adding lyrics to the video, you can save the lyrical video using the dedicated option from File menu. The video will be exported as WMV file. You can add various video effects, video transition, narrate timeline, etc., set audio levels, etc. to create a desired movie. Windows Movie Maker is one of my favorite lyric video creator software. I was able to create a nice lyrical video with ease. The only disadvantage I found in it is that it supports only WMV format to save the video. Nonetheless, this one is highly recommended for the beginners who want to create lyrical videos. DaVinci Resolve is another video editor which lets you make lyric video. Firstly, you need to add media content (image, video, audio) from Media Pool tab and drag the content to the timeline. Then, go to Effects Library > Toolbox, click on Title option and select title as Text, Scroll, L Lower 3rd, M Lower 3rd, or R Lower 3rd. You need to drag Text object to the timeline to add it to the video. Now, select the text object and edit it from right panel (see above snapshot). You can add lyrics and modify font, color, size, tracking, line spacing, anchor point, rotation angle, drop shadow, stroke, background, etc. This way, you can add multiple text objects and add lyrics to them. You can manually sync the lyrics with the audio using the timeline. For saving the lyrical video, go to Deliver tab. Here, you can modify resolution, output profile, output format, etc. video parameters before exporting the video. The supported formats include AVI, DPX, DCP, MP4, etc. DaVinci Resolve is a feature-rich video editing software. It can be used as a color grading software, video rotator, etc. Openshot is yet another video editor which can be used to create lyric videos. It is a free and open source video editor software. The procedure to make lyric video is similar to that of other listed lyric video maker. First, import media files and drop them to the timeline. Then, go to Title menu from where you can add normal or animated text to the video. It provides few predefined templates to add lyrics in certain formats like bubbles, bar, smoke, header, sunset, etc. For animated text, it requires Blender software to work. After choosing a template, you can add text filename and actual lyrics and then modify font, color, and background. It provides an Advanced Editor too, but it works with Inkscape software only. After creating titles with lyrics, drag them to the timeline one by one from Project Files section. The duration of each one of these can be synced with the audio from the timeline. You can also add multiple effects, transitions, etc. to the video in this software. To export the video, simply go to File menu and click on Export Video option. Here, you can select output video format as AVI, MP4, WebM, MPEG, etc. Also, you can customize, video profile, quality, etc. parameters. Openshot is one more good lyric video creator for Windows users. Express Animate is the next lyric video maker software for Windows. This is basically a video editor which is free for non-commercial purpose only. 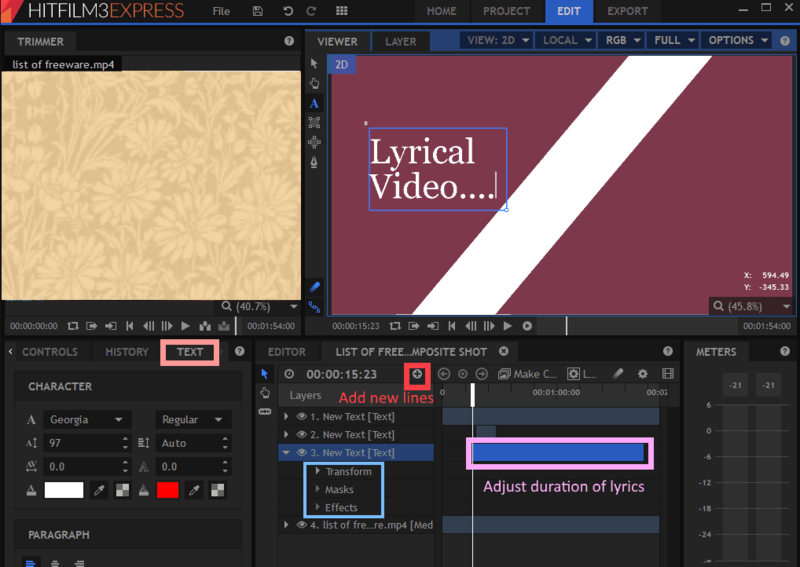 In order to create lyrical video, add media files and drag them to the timeline. You can now add text boxes using the dedicated option Add Text. Set duration for each of the text boxes and sync them with the audio using timeline. Apart from basic font modification, you can add animation effect to the text by right-clicking the text box. In addition, it also provides blending mode such as Dissolve, Darken, Multiply, Lighten, Overlay, etc. The supported formats to save final lyrical video include MP4, MKV, 3GP, MPEG, MOV, OGV, WMV, etc. Express Animate can also be used to change GIF speed, create GIF meme, etc. Shotcut is yet another nice lyric video maker for Windows. It also follows the same procedure to add lyrics to videos as above listed lyric video creators. Simply add media files, drop them to timeline, and then use timeline to create a lyrical video using Text object. You can add text by using Filters >Video Filters > Text option. It also provides real-time preview of the lyrical video. The final video can be exported in a wide range of video formats, like MP4, AVI, MPEG, OGG, WMV, FLV, 3GP, M4V, MKV, ASF, SWF, etc.